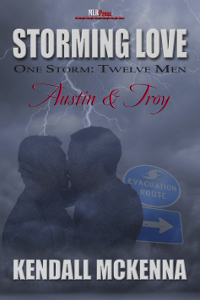 When Hurricane Lauris strikes, former lovers, Gage and Collin find themselves trapped together with old emotions and passion rising between them. As a professional rider on the NRHA circuit, Gage Chapman has known success. He's also known discrimination. Many people didn't want an openly gay rider competing in the sport, much less winning again and again on his champion Paint stallion, The Shaman. 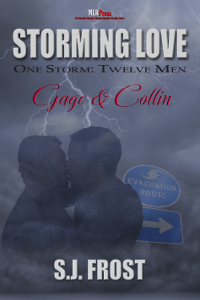 Wanting to get away from it all, Gage had left Utah to set up a breeding farm in North Carolina and there, he found what he'd always hoped for, a man he could love. Collin Maddox is the town deputy with his sights set on becoming sheriff someday. He knows local attitudes wouldn't be real pro on voting a gay sheriff into office, so he's kept his sexuality a secret for years. For all the care he has for Gage, his secret tore them apart, leaving them both with regrets and broken hearts. Now Hurricane Lauris is coming in fast and strong. Gage has refused to evacuate and leave his horses behind. Knowing Gage is alone, Collin goes to Gage's farm to help him, only to find himself trapped there. Hurt, anger, and passion erupts between them. As the storm rages around them, both men wonder if this is a new beginning, or the final ending. Bradley is just a normal, unassuming man. He works as a banker during the day, then goes home to his dogs and his grandfather. There may be the occasional speed bump since Gramps has several medical conditions that keep him home bound, but that nothing that Bradley can't manage. It's not like he even has a social life. Not so soon after breaking up with Mike, the man who Bradley had thought would be the 'one'. Only to find out that Mike was a jerk. 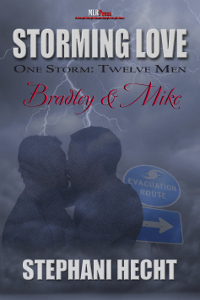 When ex-PJ, Mike finds out that his ex is planning to ride out the upcoming hurricane, he doesn't know whether to strangle the man or to go help him. In the end, love prevails and Mike rushes to Bradley's side. Will they survive the hurricane? Or are they doomed? Is it possible to fall in love from nothing more than a few phone calls and e-mails? Dr. David 'Bear' Berickza thinks so. Despite the distance and limited contact, Bear can only think about Travis Michaels, a fellow veterinarian in the small town of Timber Creek. When he hears that Timber Creek is directly in the path of Hurricane Lauris, Bear makes a promise. He will be there to help Travis and his daughter, the smart-mouthed Tina, to save the abandoned animals. The road to hell is paved with good intentions, and when Lauris hits, Bear and Travis find that despite their best efforts, it's going to take more than that to save any lives, including their own. Hurricane Lauris tore through North Carolina, leaving devastation in her wake. When the Marines of Camp Lejeune respond with help and resources, Staff Sergeant Troy Matson immediately volunteers. His mission is to assist Sheriff's Deputy Austin Delaney and his K9 partner, Decker, search for trapped survivors. Their mutual attraction is instant and intense, but all of the destruction leaves Troy conflicted. Austin proves to be a surprising source of comfort and understanding in Troy's search for redemption, but returning to their daily lives might end what has only just started. Doug travels from Arbor Heights to stay with his grandmother Noel during one of the largest hurricanes North Carolina has seen. 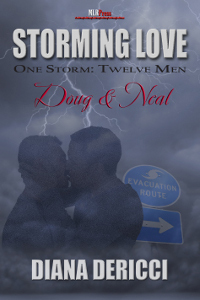 What starts as a support trip becomes more intense when her neighbor's house is damaged during the storm, forcing Neal to bunker down with Doug and his grandmother. But it's not just a hurricane tossing Doug's life around. There's a boyfriend back home causing him to question their relationship, and an unexpected attraction for Neal. Doug's life will never be the same after Hurricane Lauris.